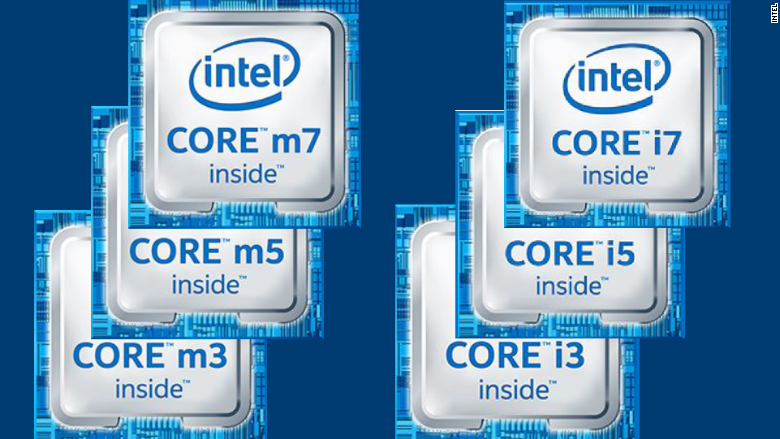 Intel's new sixth-generation Core processors double performance over the past generation. Kids are going back to school and Microsoft released a new version of Windows. That means it's officially laptop buying season. Buying a new laptop is difficult. You have to choose between a dozen or so computer brands, each with its own multiple lines of laptops, each of which comes in various iterations and confusing specifications. (What's better: The HP Spectre x360 13-4100dx or the MacBook MK4M2LL/A?) It's enough to make your head hurt. Now you've got yet another consideration: Intel (INTC) introduced a new lineup of Core processors on Wednesday, and you've got not one, not two, but six to choose from. The new chips are Intel's sixth-generation Core processors. Intel claims that the new chips double the performance, triple the battery life and deliver improved graphics over the previous models. The smaller-sized chips will also let PC makers build their new computers to be thinner and lighter. Generally speaking, the "i" processors are faster and more expensive than the "m" processors, and the higher numbers are faster and more expensive than the smaller numbers. But determining how much much speed you really need can be tricky. The best way to figure out which of Intel's six new processors to get is to consider what you plan using your new PC for. Do you want to use it for basic tasks, such as Web browsing, Facebook and Netflix? Do you want to do average tasks, such as using Office, business apps and iTunes? Or maybe you need your PC for advanced tasks, including video editing, gesture control or gaming? 2. Moderately-priced tablet or tablet/laptop hybrid for average + average tasks = Core m5. Keep in mind that the speed of your processor isn't the only factor that determines how well your PC functions. For instance, more RAM allows you to run more tasks simultaneously, and a solid-state flash drive instead of a mechanical hard drive will allow your PC to boot faster. But tailoring the processor for your computing needs is generally a good way to ensure that you're getting the right PC. The new processors will be available on Macs and PCs, but Intel said they have been designed with Windows 10 in mind. They're optimized for new Windows features, including Microsoft's Cortana voice assistant, the Windows Hello smart-login feature and other Windows-specific features.